Crepes in 30 seconds. What could possibly be better than that? Disneyland? Nope. Puppies? Close. Crepes that are 100% paleo, made in the microwave in under one minute? YUP! These 30 second paleo microwave crepes are the next big thing in easy, microwavable treats. I brought crepes to a dinner party once. Took me like 23.5 tries to get them perfectly cooked in a pan but eventually I got the hang of it. Who knew a paper-thing egg/flour disk with a little fresh fruit and Nutella could be such a hit. Not a SINGLE person declined dessert that night. In fact, I had my peeps asking for seconds. Crepes = everyone’s favorite thing. I’m not denying that Nutella probably played a roll in my success story, but no one can debate the utter brilliance of the crepe. Here is the best thing about crepes – the filling. Totally customizable, making crepes a great choice for a sweet breakfast or a savory lunch. Some of my favorite combos are bananas and almond butter, spinach and mushrooms, and of course strawberry chia seeds and chocolate. Sorry Nutella – I love you but I can’t keep you in my pantry anymore. Self control is too challenging. Nutella = OUT. Strawberry chia seed spread = IN. One of the most popular recipes on Physical Kitchness is this paleo pumpkin pie microwave soufflé. I am pretty sure it’s a hit because it’s insanely easy and super-duper tasty. 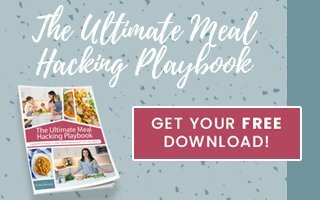 So I took note – more recipes that are healthy and delicious, simple and fast. I hear ya, I hear ya! These 30 second paleo microwave crepes will make breakfast a cinch, dinner party desserts out-of-this-world, and crush all your crepe cravings in the comfort of your own home. Basically crepes in a microwaves are my hero. The first step is making the chia seed strawberry spread. 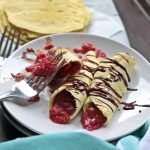 I love these fruity chia seed creations because not only does this work well folded in these decadent crepes, but you can use any leftovers as jam or sweetener in other breakfasts or desserts. Plus it’s loaded with fiber, protein, omega-3’s, and vitamin C. Simple puree one cup of strawberries with 1 1/2 teaspoons raw honey. Pour into a plastic container, bowl, or mason jar and add one tablespoon chia seeds. Mix well and place the container into the refrigerator and let sit at least 30 minutes, in order for the chia seeds to soak up most of the liquid. 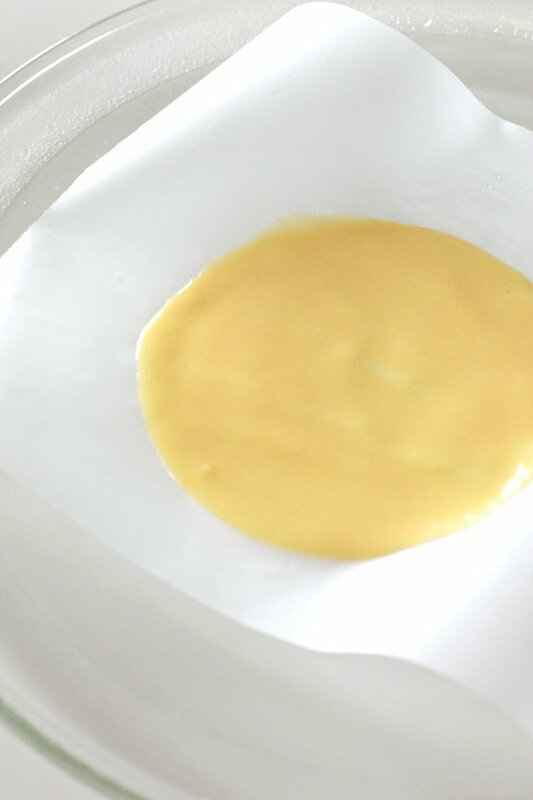 To make the crepes, crack three eggs into a small food processor or blender. Add the coconut flour, baking powder, and salt. Puree until smooth (this should take 15 seconds or less). Place a small, square piece of parchment paper on the glass microwave disk or a flat, microwave-safe plate. Pour 2 heaping tablespoons of the crepe batter directly on the parchment paper and using the bottom of a spoon, gently but quickly spread the mixture evenly to form a small, thin circle. Microwave for 25-30 seconds, until the center of the crepe is fully cooked. Quickly take the crepe off the parchment paper and flatten with a rolling pin (or your hands) if needed. If the batter was spread a little thick before microwaving, it may come out slightly puffy. 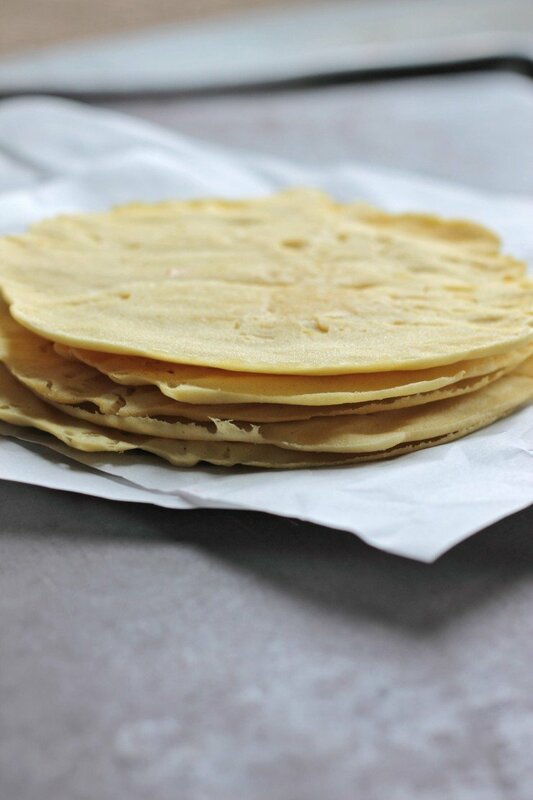 The crepe will be VERY hot so placing another piece of parchment paper over the top to flatten is recommended. The thinner the batter is spread before microwaving the more ‘crepe’ like it will be. 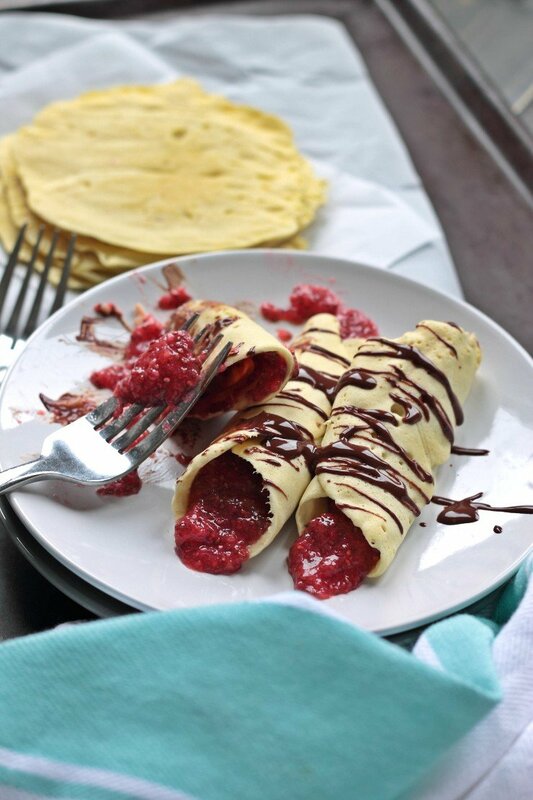 Spoon 1-2 tablespoons of the strawberry chia seed spread in the middle of the crepe and fold in each end. Or simply spread the chia seed mix on top of each crepe. To make the chocolate drizzle, place 1 dark chocolate square (I used 65% cocoa) in a microwavable bowl and add one teaspoon full-fat coconut milk. Microwave 15 seconds, then stir. If the chocolate has not completely melted, microwave another 10-15 seconds. Let cool slightly then drizzle over the top of each crepe. To make the strawberry chia seed spread, puree one cup of strawberries with 1 1/2 teaspoons raw honey. 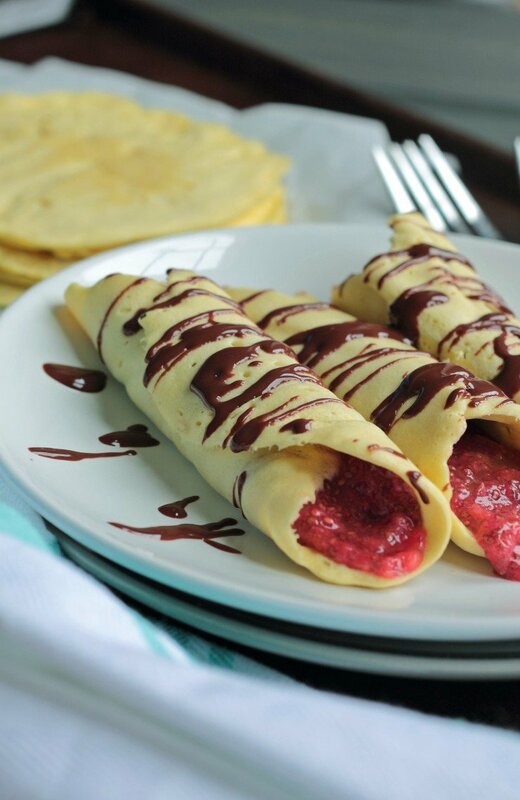 Spoon 1-2 tablespoons of the strawberry chia seed spread in the middle of the crepe and fold in each end. Good and easy are my favorite two words. Ok, maybe I have a few other favorite words but you know what I mean. Thanks Jookie! Hi Al – instead of using wax paper, use parchment paper. The batter will stick if using anything other than parchment. I love that these aren’t full of gluten and icky stuff – they look delish! Super easy to make this version! Enjoy Ivana! Mmmmm count me in for these! Chrissa you are a LEGIT genius. This is suchhhh a smart idea and i 100% am making these for breakfast next weekend. I’ve wanted to make crepes for a while but always thought i’d have to buy one of those stupid expensive crepe pans from Le Cruseut to do it. NOPE. You’re amazing. pinning this. I mean, Le Cruseut is the bomb, but save your cash and buy something else 🙂 I hope you love these crepe beauties and make ’em over and over again! OH my gosh! This is amazing! Will def be pinning this one!! Pin love is my fav. I hope you make and devour these Lauren! You had me at 30 seconds and won me over at crepes. These seem so easy and delicious! Both keywords are pretty good selling points, right?! Thanks Jessica! Wow, this I HAVE to try! 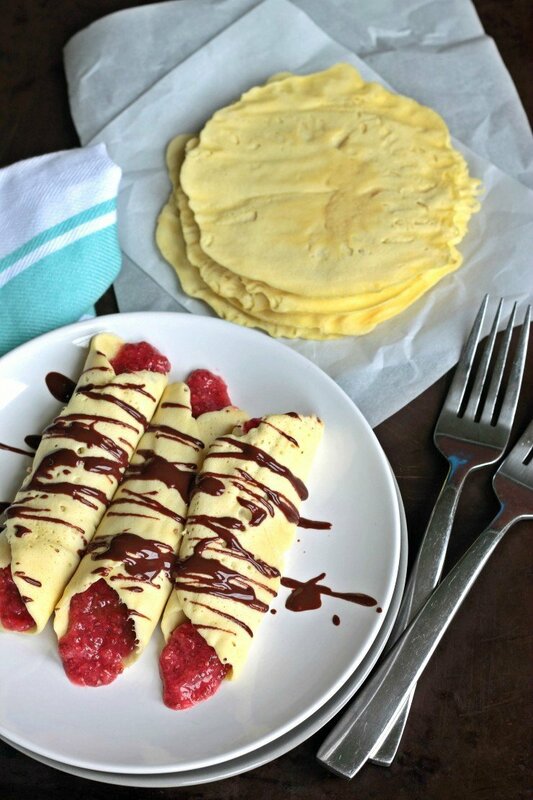 Microwave crepes sound like a great idea and these look so light and delicious too! Are you kidding me? I love you! This is the most delicious looking thing I’ve ever seen – I LOVE CREPES!!! Also, I just started my crossfit challenge and am 100% committed to clean eating. I’ve got to get these baby pounds off. I love the kid, but I want my work pants to fit again. Your blog is a God send as I try to make this lifestyle change. Thank you for your awesomeness!! These crepes look good and they are from the microwave, I am officially amazed. Glad to have amazed you Sophia! I hope you LOVE them! OMG I think I’m making these tonight to eat while watching the Bachelorette. Thanks so much for the idea!! Wow those come together so fast. Homemade crepes are the best. PALEO CREPES??? Um, yes please! Wow, I cannot wait to try these! I hope you love them Cassandra! This looks like a great and fast recipe, I can’t wait to try it! Any thing fast, healthy and tasty is a winner! Thank you for sharing! Fast is good! Especially since I’m the kind of person that needs food the second hunger strikes!! Thanks Ashleigh! Nothing. I mean, ice cream is up there, but I think I’d take a crepe over that any day! Crepes are one of my favorite dishes! I can’t wait to try this microwave version. I feel like it’s hard not to categorize crepes as ‘non-favorites’. They are just so amazing! Thanks Cathy! I love that these are gluten free. I enjoy the slightly sweet taste of coconut flour. I bet it works very well with the strawberries and nutella! Yum! I too, love coconut flour! And YES strawberries and Nutella = amazingness! Trying this with strawberries and paleo Nutella, feels like I’m committing a sin but NOT! Gaaaaah you have me drooling over here! These look amazing!! I will have to try these as soon as I introduce “flours” and seeds back into my diet. I totally love strawberry chia spread what an awesome combo!! Thanks for sharing. Thanks so much Jenn! Good luck with the reintroduction and I hope these rock your world! They are! I hope you give them a try Jenny! Looks delicious! I love crepes and so does my husband. I will need to try this out! YUM, crepes are my favorite! Thanks for sharing this! Favorite favorite. Crepes are da bomb!!!!!! These look and sounds amazing. 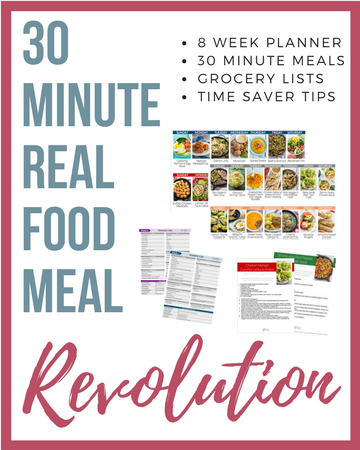 I pinned it so I can make some as soon as the Whole30 is over. Yum! That’s a great reward for finishing Whole30 plus still super clean! Thanks Shann! Gotta try them Alicia! It’s such an easier way of making them! WOW! these look amazing!! and theyre gluten freeeeee yaaay! I always thought crepes were practically impossible to make, so I’ve never tried. Now I absolutely want to try these! They look so easy and delicious! Thank you! Not impossible, but not easy either! The microwave version is a piece of cake! I hope you give these a whirl Samantha. Crepes are one of our favorite breakfasts but I had no idea you could make them in the microwave. Honestly I had no idea either, until I started experimenting!! Now it’s easier than ever!! Microwave crapes!!?!?!? This is fantastic! Thanks for the recipe! You are a genius! YUM! I’ve always wanted to try making crepes by they looked intimidating. But you make it look SO EASY! Crepes ARE intimidating! But I got too annoyed by that so I had to create something easier!! These certainly are! no denying crepes are one of everyone’s favorites! But SAME with taking so many tries in getting them the way they were suppose to come out! This microwave idea is GENIUS. Time saver, #winning. You are so welcome Sarah. Quick is sooooo perfect when it comes to crepes 😉 When the craving strikes, ya just gotta have them asap. Genius! Can’t wait to make these! Thanks so much Nicole! Enjoy my friend! These look so simple and delicious! I love fresh crepes and homemade jam. Definitely giving this a try! I haven’t either! Crepes are the best (as is Nutella). I hope you love them Cayanne! These look amazing! When I saw the title, I was like NO WAY can you cook these in 30 seconds. But that’s an awesome way to make these. Love that there’s 3 eggs for all that protein too. Hehehe I promise I’m not lying! 😉 Oh yes, gotta love all that protein – but eggs are kinda my thang. Thanks so much Melissa! I’m trying this tomorrow! So excited! But I’m curious, could almond flour be able to be used instead? I haven’t tried it to be honest! You might have to play with the ratio a bit. Keep me posted if it works! Do these taste very “Eggy”? I’ve attempted recipes (like cloud bread) that really just end up tasting like scrambled eggs. If they don’t, I’ll definitely be trying them! Hmmm I don’t think so!